“Only the Romans are permitted to execute someone,” the Jewish leaders replied. Relate: There was a group of pirates who worked off a part of the coast of Turkey known as Cilicia. For roughly two hundred years they wrecked havoc on the shipping lanes of the eastern Mediterranean. It was an open secret who these pirates were and where they were operating out of. They were safe from getting caught and being stopped because they made sure to keep up a steady supply of slaves to the most powerful Roman Senators. Since Rome had pretty much conquered the whole of the Mediterranean world and the frontiers to the northwest (Gauls) northeast (Germans) and east (Persians) were all considered too daunting a task, having this steady supply of fresh slaves was incredibly valuable. These Cilician pirates were safe. They were, that is, until they managed to get their hands on the wrong captive. At the time this twenty-something brash young man was not incredibly well known. Yes, he had come from a distinguished line and had been earmarked by some as an up and comer in Roman politics, but for most Gaius Julius was just another rich young man who would bring in a great ransom. When Gaius learned that they were planning on ransoming him for twenty talents of silver (about 600,000 dollars or 380,000 pounds or 70,000,000 yen) Gaius was incensed. He was worth far more than that. This brash young man demanded they raise the ransom to 50 talents. The pirates obviously agreed and they released some of his servants to go collect. It took those servants a little over a month to gather together enough money to set young Gaius free. While they were doing so, he was a “guest” of these Cilician pirates. Unlike other “guests” they have had, the pirates really took a liking to the young man. He didn’t display any of the fear or the loathing they were used to. He worked with them and competed against them in various athletic competitions or feats of strength. At other times he took to writing poetry and would use them as an audience to test it out. Young Gaius even went so far as to insist they quiet down at night so he could get his sleep. What other prisoner would dare insist his pirate captors “pipe down” and then actually have them obey? The one thing he never let those pirates forget, however, was that once he got free, Gaius planned to raise a fleet, capture them all, and have them crucified. The pirates thought this was just part of the dauntless boy’s braggadocio and they loved him all the more for it. After 38 days the money was raised and Gaius’s slaves returned to the pirates with it. True to their word, the pirates freed Gaius and with much laughter, shaking of hands, and slapping of backs, he left their company. He also was true to his word. By the time he returned to Rome, Gaius Julius Caesar was already well into the process of raising a fleet. 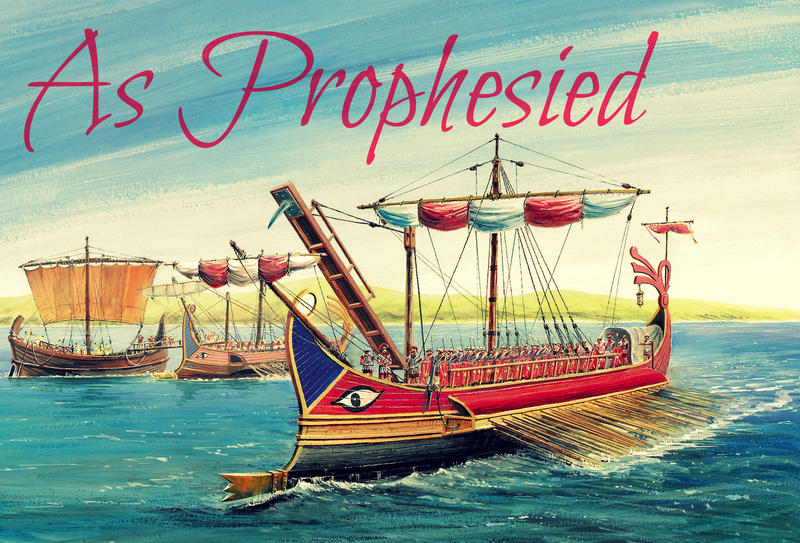 He then took that fleet to the high seas, caught those Cilician pirates and crucified them just as he prophesied. React: I’m sure there might be other such tales floating around, but this true story from Julius Caesar’s early days is the only other prediction of a crucifixion I know of. Although he didn’t show it, I am certain that he felt just as much fear as many others did when they found themselves in his situation. Truth is, Julius Caesar had already been running up a good amount of debt and he could not have been as certain as he showed that the money would be raised. As he lay down to sleep each night, after telling those uncivilized pirates to shut up, thoughts of his revenge were probably a comfort to him. No matter how bad things got for him, Caesar would take the world in his hands and make it better. Jesus had also prophesied a crucifixion. Unlike Caesar, his prophecy was not a dream of revenge but rather of redemption. While Caesar dreamed of getting even, Jesus dreamed of gaining reconciliation. As an itinerant rabbi, Jesus would often have been sleeping out in the open, in the cold, as rain poured down on his head. Like Caesar, I can picture Him in those moments thinking thoughts like, “As bad as things are, they will get better. There is a crucifixion coming and it will set everything right.” How very different their prophecies were. How very different the thought process between this world and its Savior. God, I am so thankful that the cross did not take You by surprise. I am so glad that it was why You came. Without the cross and the empty tomb, I have no hope. It is the one and only reason that I can even come before You now in prayer, with confidence. Your grace has covered all of my sins. Your sacrifice has paid my debts. Your suffering has bought my freedom. There are no words to express my gratitude. There is no gift I can give to demonstrate my thankfulness. Even as I give You my life, I understand that it is already Yours. It was already bought and paid for, as prophesied, with Your love.